Sailor Cosmos was a character who played an important part in the Stars arc of the Sailor Moon manga, where she was revealed to be the true form of Chibi Chibi (who had very different origins in the anime). After Sailor Galaxia's death, Chibi Chibi revealed to Sailor Moon that her true form was in fact Sailor Cosmos. Her future, as told to the Sailor Quartet, was not a hopeful one - Sailor Chaos waged war against the universe, and everything and everyone Sailor Cosmos knew was destroyed to the point where nothing could be salvaged even if the war ended. Upset, scared, and unable to do anything, Sailor Cosmos ran away from her future, opting to go into the past to destroy Chaos before it achieved its terrible Senshi form. To destroy Chaos, she decided that she also had to destroy the Galaxy Cauldron, and so in the form of Chibi Chibi she tried to guide her past self, Eternal Sailor Moon, towards that end. Even though Eternal Sailor Moon was determined to save the Cauldron and chose a different path, she nevertheless inspired hope in Sailor Cosmos with her power and courage. She stated that the Eternal Sailor Moon who had saved the galaxy was, in fact, the true form of Sailor Cosmos, and that once she had that same courage and strength, only then would she truly be Sailor Cosmos. What happened to Sailor Cosmos after she sent the Sailor Quartet to the future in Act 52 was not specifically stated. She said that she would return to her own future, inspired by Sailor Moon's strength, and that she would resume her fight in order to reclaim the mantle that she lost with her cowardice. Sailor Cosmos' nature was not entirely clear, and her appearances in Act 51 and Act 52 brought forth more questions than answers. 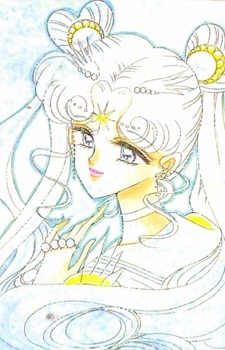 It was stated by Sailor Ceres that she was the ultimate future form of Sailor Moon, but it was unclear whether Sailor Cosmos was the future self of the current Sailor Moon (thus making her the next incarnation after Neo-Queen Serenity), a reincarnation of the current Sailor Moon, a descendant of the current Sailor Moon, or even Sailor Moon from an alternate future. Naoko Takeuchi herself seemed to imply when questioned that Cosmos' true identity was intended to be ambiguous to everyone, including herself. Sailor Cosmos reveals herself in the final Act of the manga. She comes from a future which has been all but decimated by the battle with Chaos; after ages of fighting, she despairs and flees to the past as the infant ChibiChibi, to encourage Eternal Sailor Moon to defeat Chaos when she has the chance. At first, she wants Sailor Moon to destroy the Galaxy Cauldron altogether, ensuring Chaos' destruction, but Sailor Moon protests, realizing that if the Cauldron is destroyed no more stars will be born, leaving the Galaxy without a future. She chooses to sacrifice herself to the Cauldron, which Cosmos finally realizes to have been the right decision. Reminded of the strength and courage she herself needs to have, she returns to the future with new hope. The manga implies that Sailor Cosmos is the ultimate form of Sailor Moon; this fact is confirmed in a magazine interview with Naoko Takeuchi. There are multiple theories in the Sailor Moon fandom as to what this means. Sailor Cosmos never makes an appearance in the anime series, although the silhouette of ChibiChibi's adult form (the "Light of Hope") bears a strong resemblance to her. Naoko Takeuchi commented that she wished Sailor Cosmos had been in the anime.